Image credit: Intel Extreme Masters. Over the weekend, 20 top PlayerUnknown’s Battlegrounds teams faced off at Intel Extreme Masters in Oakland, California. From inside a series of what we might call PlayerUnknown’s BattleCubicles, squads squabbled over a $200,000 prize pool. When the smoke cleared, a team that didn’t even get invited took top honors, besting big-name teams, without even winning the final match. This shows that PUBG has potential to be a very different kind of esport, but it’s not there yet. PUBG is a fun game to watch. It rose to absurd levels of popularity on the backs of streamers, and it will probably remain among the top games on Twitch until every other game has a battle royale mode and also real life is battle royale. But watching one streamer play for entertainment purposes and watching 80 different players go at it with the goal of winning at all costs are two very different experiences, as this weekend’s tournament showed. IEM, which I attended over the weekend, exemplified that distinction. The final five minutes of each PUBG match were always thrilling, as the circle tightened around the remaining competitors and forced them to make lightning-quick live-or-die moves. But everything leading up to those moments is a lot of waiting around. Players spent more than half of each match picking up gear, jostling for position, and only occasionally finding themselves in skirmishes, noted attendee Dylan Jones, a game designer. “Earlier in the matches, you’re just watching icons move around,” Jones said, commenting on how the broadcasters often seemed to default to showing the game’s top-down map in lieu of following specific characters. The maps provided valuable context and positioning info, but also had the effect of distancing viewers even further from what little action there was. The nature of the tournament also changed the way teams approached the game. With $200,000 on the line, players erred on the side of caution. Rather than do something they’d try on stream like ramping motorcycles onto rooftops, more often than not they watched, they waited, and they built cover out of cars in an attempt to hunker down for the long haul. As a result, even when something did happen, viewers didn’t always catch it. Meanwhile, on the other side of a massive divider in the middle of the arena, a CSGO tournament was taking place, and the contrast in hype moments was stark. Uproarious cheers erupted on a regular basis on the CSGO side, fully audible from the PUBG area. If not for the divider, they would have been deafening. Outside the final five or so minutes of each match, however, action-packed PUBG moments were met with scattered, sometimes confused applause. It was surreal, like attending a golf tournament with the Super Bowl happening just across the street. Another handicap that PUBG needs to overcome is that it also includes a much greater component of randomness than many other competitive games. You don’t know where the circle’s gonna close. You can’t be sure what weapons you’ll find. You never know when somebody might nail you with a headshot before you even know they’re looking at you. That makes it difficult to suss out who’s really the best. Although major esports orgs like TSM, Cloud 9, and Team Liquid fielded PUBG teams, the winners of IEM Oakland were aAa, a long-running but lesser-known French organization seemingly named by a person who fell asleep nose-first on their keyboard. They performed consistently throughout the weekend, amassing enough points across a series of matches to win by a narrow margin, but signature moments were in short supply. Veteran esports commentator Lauren “Pansy” Scott, who called a few matches over the weekend, is more aware than anyone that there are still kinks to work out, but she feels like PUBG is better positioned than most games to be an esport that anybody can enjoy. “For me, PUBG is actually one of the simplest games, if you boil it down to the core of it all,” she said. it’s about a bunch of people trying to kill each other on an island. Compared to the arcane rules underlying games like League of Legends or the wacky economy of CSGO, PUBG’s setup of 100 people landing on an island and having to kill each other is refreshingly accessible to the general public. “Most people have seen Battle Royale or The Hunger Games or something of the sort at some point in their life,” Scott said. However, even with commentators like Scott doing their best to explain teams’ early-game tactics and making good use of the map, it took a lot of effort for viewers to follow along with the broadcast. Sudden shifts in perspective that immediately ended with somebody dropping dead and other, similar hitches and glitches didn’t help. Scott thinks those things are solvable problems. The game’s spectator tools will need an overhaul, she said, but it’s equally important that commentators and analysts learn and grow with the game. “It’s on casters to create the correct narratives and push these situations that are followable,” she said. “I think we as casters need to specify ‘OK, this is exciting because of X, Y, and Z.’” She added that she felt like casters and observers improved significantly as the weekend went on, making big strides from match-to-match as they gained better understandings of what to focus on and when. “It’s chaos,” she said, but it’s showing signs of progress. Whether pro PUBG matches’ big moments are worth the wait is still up for debate, but the final handful of minutes, when 30 or fewer players are left and the circle is closing in, are undeniably wild. The pace goes from “80 turtles trying to kill each other by solving a series of complex geometry equations” to electric in a matter of seconds. All the stories that casters have been meticulously sculpting slam into each other like tidal waves. 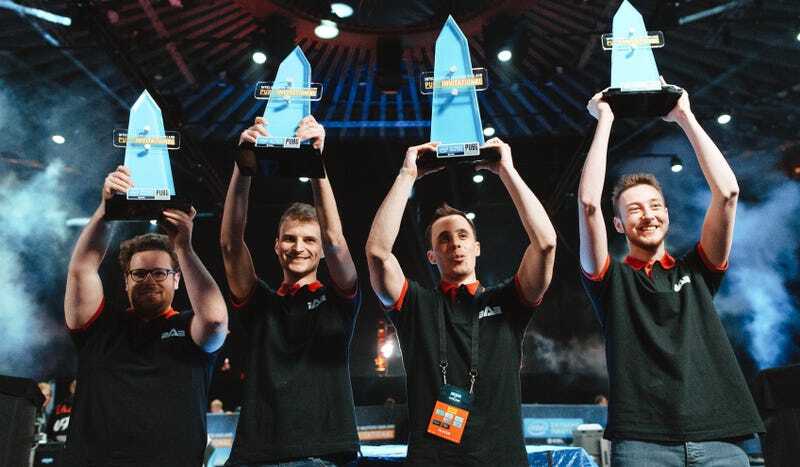 While tourney winners aAa only managed to win one chicken dinner across eight games, their victory, earned through attrition and consistency, is kind of a perfect encapsulation of PUBG’s potential as an esport. Hardly anyone expected this team, small-timers who entered through online qualifiers instead of an invite, to take first. It’s tempting to chalk it up to that RNG chaos everybody’s been talking about, but aAa won precisely because they didn’t let the randomness of PUBG get to them. They stayed near the front of the pack for most of the weekend and delivered when it mattered most.